2 Dec : The sun went down on the evening of 1st December and a three-way conjunction of Venus, Jupiter and the Crescent Moon took place which will be a spectacular event for skygazers in the next few days. It is time to step outside and look southwest to see a celestial phenomenon. With the exception of the Sun and the Moon, Venus is the brightest source of light in the heaven, and Jupiter comes a close second, Science Popularisation Association of Communicators and Educators (SPACE), President Chander Bhushan Devgun told a news agency. In the evening sky, skywatchers can see Venus and Jupiter getting close to each other as they circle the Sun. Conjunction is a term used in positional astronomy. It means that, as seen from the Earth, two celestial bodies appear near one another in the sky, he said. The celestial triangle will be visible from all parts of the world, even from light-polluted cities.People in New York and Hong Kong will see it just as clearly as astronomers watching from remote mountaintops. Only cloudy weather or a midnight sun can spoil the show, Devgun said.The great conjunction offers something extra to Europeans. For more than an hour on Tuesday, the crescent moon will eclipse Venus. Astronomers call such an event a "lunar occultation". 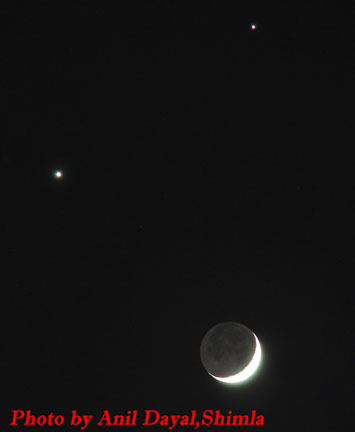 "Venus emerging from the dark edge of the moon is a remarkably beautiful sight", Devgun said.